The first thing to note about modular UPS systems is that they tend to be rated at Unity power factor (kVA=kW) and sizes are referred to in kW (kilo-Watts). As with any UPS installation the first step is to calculate the load size on day 1 and the expected future load size. Once this has been established a UPS frame size can be selected. The UPS frame for a modular UPS is a bit like a server cabinet. This will house the UPS modules and sized to deliver an overall kW-rated supply. The frame will be limited to a total amount of power it can deliver by the size of the electrical bypass and distribution system which is normally built-into the lower half of the frame. UPS frame sizes are based on multiples of the typical UPS module that they can house. If the typical UPS modular is 40kW, the frame sizes may be 120kW, 200kW, 360kW or 480kW allowing room for 3, 5, 9 or 12 UPS modules. The next stage is to select the number of UPS modules required to meet the day 1 load and level of resilience. If the load size is 60kW, then 2×40kW modules could be used in parallel but with no added resilience other than their static switches. Adding another 40kW module would allow a 3-level configuration to give N+1 with two modules sharing the load and the third on standby. If further growth is required then it will be important to either allow space for additional modules in the selected frame size and/or for an additional UPS frame to be added at a later date. Battery runtime is also an important consideration. Some modular UPS systems offer a ‘combi’ type UPS frame that can take UPS modules and a limited battery runtime pack. After this battery sets are either supplied in a matching cabinet to the UPS frame or additional battery boxes or stands. Advances in power electronics allow modular UPS to present an extremely attractive alternative to mono-block type UPS systems. Both systems can be highly efficient and offer advantages to data centre operators. Modular UPS have the edge when it comes to future expansion and potentially the overall floor space required whether in the white or grey areas or a dedicated plant room. These advantages come at a price but they can be enough to tip the balance in favour of modular. 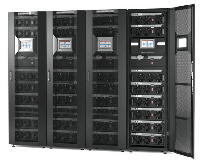 EcoPowerSupplies works with the three leading modular UPS system manufacturers including Eaton, Huawei and Riello UPS. The following video from Riello UPS on their Multi Power system provides an interesting ‘walk-through’ the concept. If you would like a site survey or project meeting to discuss your application and the application of both types of UPS system please contact the Eco Power Projects team on 0800 210 0088 or email us.